It’s a lot like marriage, this glamping. I mulled the comparison as I watched Henrich, our guest services officer, unzip–yes, unzip–our room for the next three days. Sleeping in a tent was not exactly my idea of a romantic anniversary getaway but it was my husband’s dream adventure, and like I said, marriage–it’s all about compromise. “This is it! Welcome!” Henrich says a little too cheerfully, it made me nervous. Is there a catch? I entered the tent and did a quick survey: bed, check; comforter, check; fluffy pillows, check; bedside lamp, check; carpet (sort of), check; electric fan, check; electric sockets (for charging gadgets), check; wardrobe drawers, check; toiletries, check; mini bar with cold drinks, check; mini-bar, check (plus it transforms into a desk). Oh and yes, windows, check! We’ll be fine, I thought. We were in Bluewater Sumilon, the first resort to offer glamping in the Philippines. 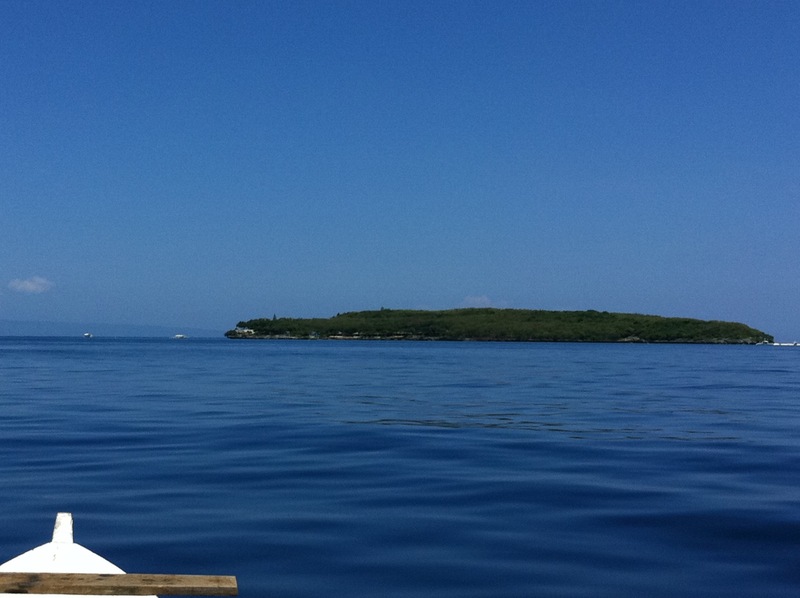 This 24-hectare island off the southern tip of Cebu has the bragging right of being the country’s first marine reserve, having been under the care of the Silliman Marine Laboratory in Dumaguete from 1974 to 1984. With its underwater wealth and shifting sandbar, Sumilon has the credentials to hop on the bandwagon of travel trends, which in this case, is glamping or camping in luxury, without so much as having to pitch a tent or roast your own marshmallow. It’s five-star service in the jungle. Glamping started as a popular option for visitors to Africa’s wild lands. Apparently, there’s a section of society that wants the outdoors without the roughness, the adventure without the discomfort, the moon and the stars without the mosquitoes. And so travel designers–another newly invented title for those in the high-end travel business – came up with luxury tents that would shame most hotel rooms. Naturally, the price would also shame most hotel guests. How’s this for a spa area? 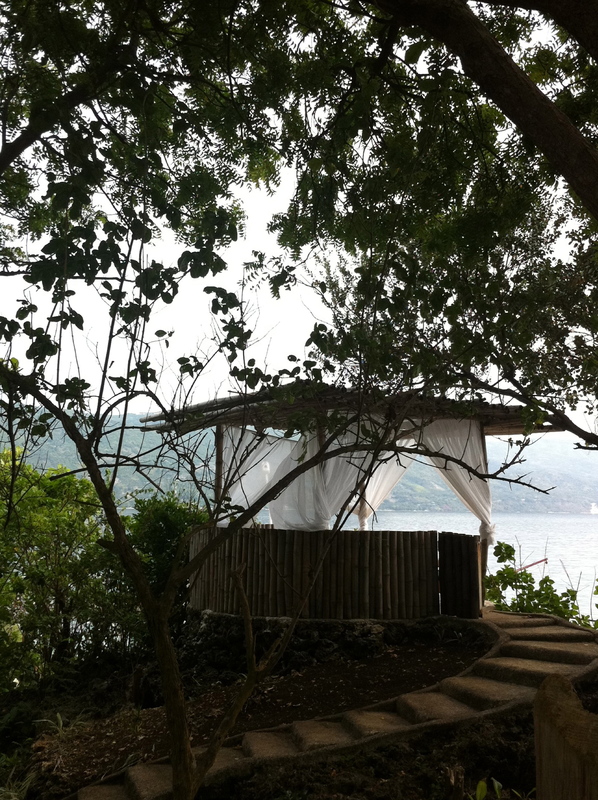 Thankfully, Bluewater Sumilon’s glamping experience is more about convenience than luxury. The basic comforts required by women like me, who can’t survive without a decent restroom and clean running water, and men like my husband, who want to abandon all forms of civilization every now and then, are met in perfect measure. Bluewater Sumilon found the set-up where the glam part doesn’t kill the camping, and the camping part doesn’t kill anybody. The campsite sits beside the lagoon and looks out to the snorkeling area of Sumilon’s deep-blue waters. The restrooms, to be shared by the residents of six tents, are about 10 meters from the campsite. The restaurant is a long way up, but the food’s worth the climb, especially the desserts. Except for the absence of air-conditioning and telephone, the glamping tents mirror the resort’s regular villas. The difference is that you feel the sand beneath the “carpet” as you make your way to bed, and at night, you hear the crickets and geckos like they were sleeping next to you. What does put the glam in glamping in Sumilon is the camp assistant – or butler if you wish to be aristocratic about it – that is assigned to every tent. The camp assistant can map out your activities during your stay, arrange campsite dining for you, wait on you while you eat, give you a tour of the island, bring your towels and picnic basket when you want to swim on the other side of the island, and most importantly, take your pictures. Our guy was Rodel from Leyte whose last glamping guests were a group of around 20 yuppies from Cebu City. After them, we were easy. We simply did everything listed on the resort’s brochure – snorkeling, kayaking, swimming, trekking (Note: Do NOT wear slippers when you trek. The limestone path will kill your feet, trust me), campsite dining, restaurant dining. 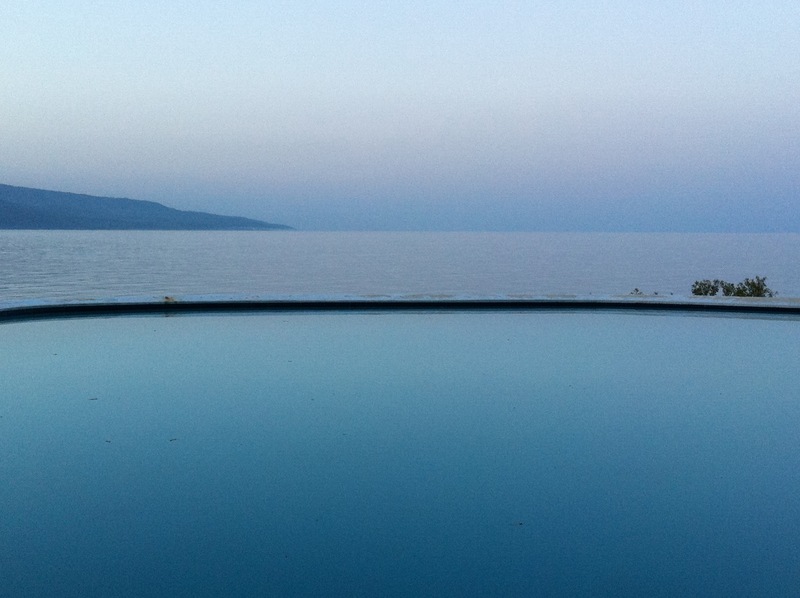 We ended every day with a dip in the infinity pool, watching the sun set on mainland Cebu and dreaming of more moments as peaceful. The only special request we had was for Rodel to arrange a swim with the whale sharks in Oslob, just across Sumilon Island, and that he did efficiently. We took the 9 a.m. free boat ride to the mainland then got on a Bluewater van for the 10-minute drive to Oslob. By 10 a.m., we were playing underwater and being chased by whale sharks as docile as puppies. We happily fell into the tourist trap of paying P500 to rent a waterproof camera for our pictures and video withe the whale sharks. 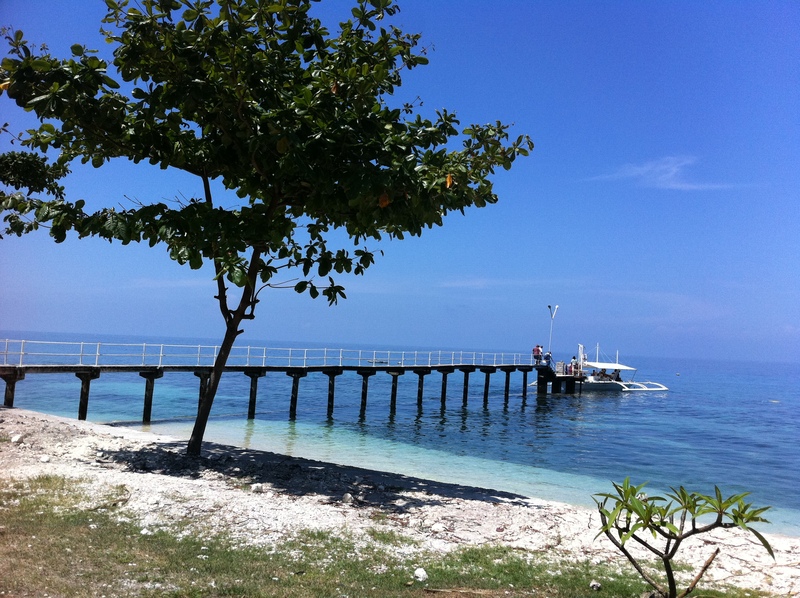 Port in Oslob, Cebu. From there, Bluewater picks up its guests and brings them to its own port for the 10-minute boat transfer to Sumilon Island. If you are coming from Cebu City, take a bus or publc van to Bancogon, Oslob for the boat to Sumilon. Bluewater Sumilon is the only resort on the island, and it doesn’t come cheap. Its Glamping Discovery package costs Php10,000/night on weekdays and Php12,000/night on weekends. A tent can accommodate up to two adults and two kids. 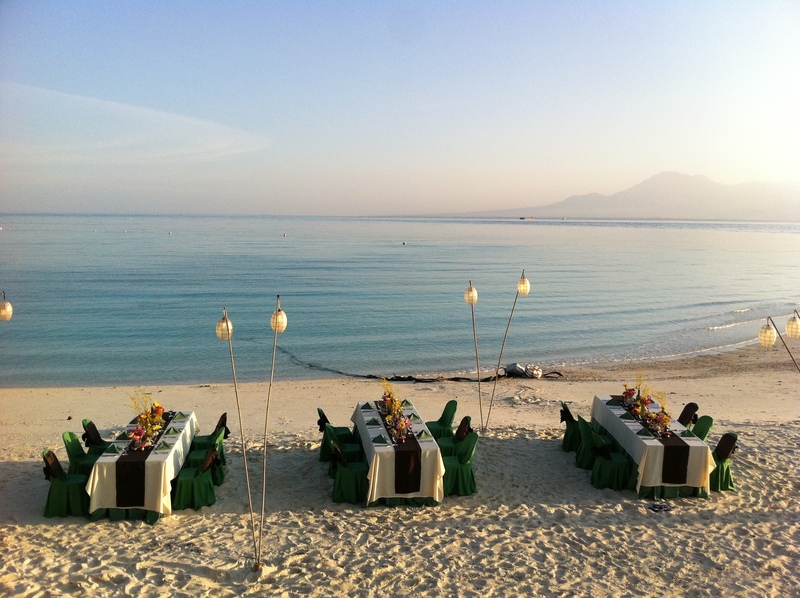 This includes all transfers, meals, afternoon tea, minibar goodies and island activities. Day trips offer more bang for the buck at Php1,500/person on weekdays and Php2,000/person on weekends, inclusive of round trip boat transfers from Bancogon, set lunch, and all island activities including access to the infinity pool. Reblogged this on International Camp Week.